This beautiful memorial cross is the perfect way to remember your best friend. 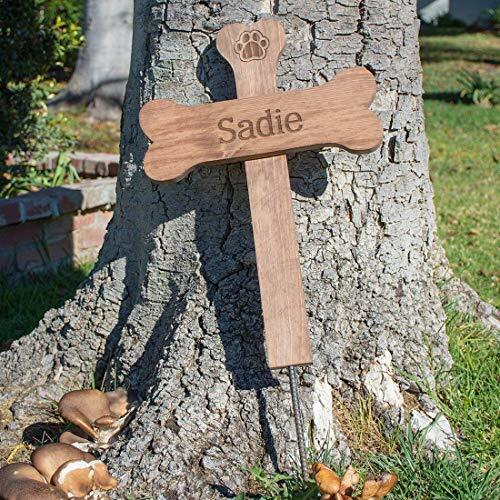 Handcrafted with domestic US pine, each cross is engraved with your personalization and a paw print at the top. The cross is then finished with your choice of stain. (Pictured in Medium Walnut stain). The bottom of the cross comes pre-drilled and ready for you to insert a metal stake, which is included. Please provide the name you would like engraved. Cross measures 22" tall and 14.5" wide. Wood is 0.75" thick. If you choose this option, please email us the photo you would like to use. Use the Amazon CONTACT SELLER button to send us your photo. Photo should be medium to high resolution and able to be sized to 4" Note in order to fit, we may need to crop the photo.